↑ रेबर्ण, एलन (2001). Naming Canada: Stories about Canadian Place Names. टोरंटो: युनिवर्सिटी ऑफ टोरंटो प्रेस. पृ॰ 45. आई॰ऍस॰बी॰ऍन॰ 978-0-8020-8293-0. 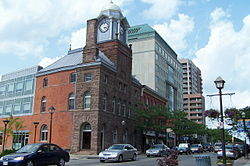 ↑ अ आ "Brampton at a Glance". brampton.ca. अभिगमन तिथि 13 जून 2012.